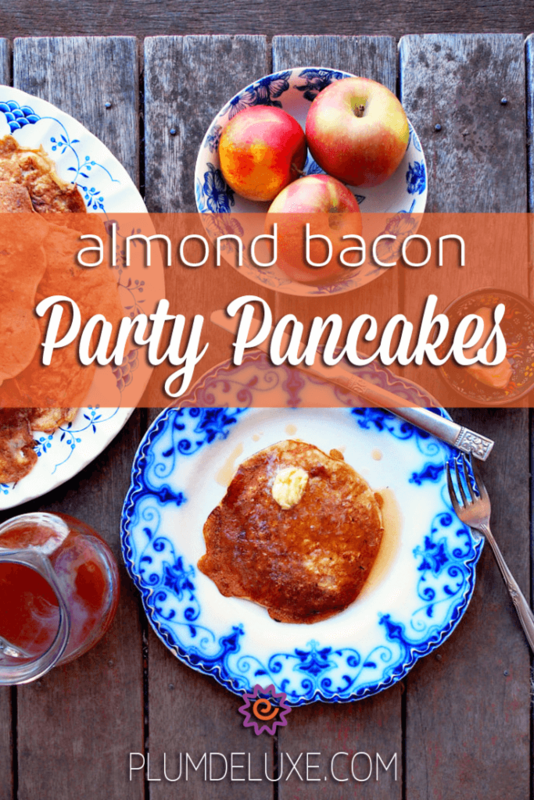 Pancakes are always a happy thing for me, but these Almond Bacon Party Pancakes are downright celebratory. Fragrant with almond and studded with crispy pieces of bacon, these beauties are just the thing for a summer brunch party. When you add salted butter and a drizzle of apple syrup to your stack of party pancakes, the happiness levels go through the roof. For me, pancakes are weekend food, for lazy Saturday mornings when everyone has slept in and a jolly brunch party outside is the best way to get the day started. Brunch party pancakes are simply pancakes with extra bits. A spoonful of flavored extract instead of vanilla, a generous handful of toasted nuts or dried fruit, and a batter fortified with oats to make them extra hearty and provide plenty of energy for a summer Saturday of swimming, bike rides, and water fights. Over the weekend I made almond bacon pancakes with an apple reduction syrup. Dense, rich, and full of flavor, they delighted us served hot for brunch and later cold, as a quick snack grabbed mid-afternoon and wolfed down on the fly. If almond isn’t your thing, you could try something light and citrusy instead, like our Lemon Ricotta Pancakes, or make them extra decadent with a generous addition of cocoa nibs in our Cocoa Nib Pancakes. I like brunch menus to be delicious and hearty, with enough oomph to them to keep us going until supper, so I made these brunch party pancakes with oats soaked and softened in plain yogurt, then thickened with eggs and just enough flour to make sure the batter isn’t too runny. No worries if you don’t add enough flour, though — this just means that the runnier edges will flutter out like flower petals instead of retaining a perfectly round shape. When soaking the oats, I like to add the fried bacon pieces as well so the batter soaks up plenty of good bacon flavor. While the oats were soaking, I made an apple reduction syrup. This is one of my favorite things to put on pancakes. It is simply 4 cups of apple juice brought to the boil then simmered until it reduces down to about 1 cup. 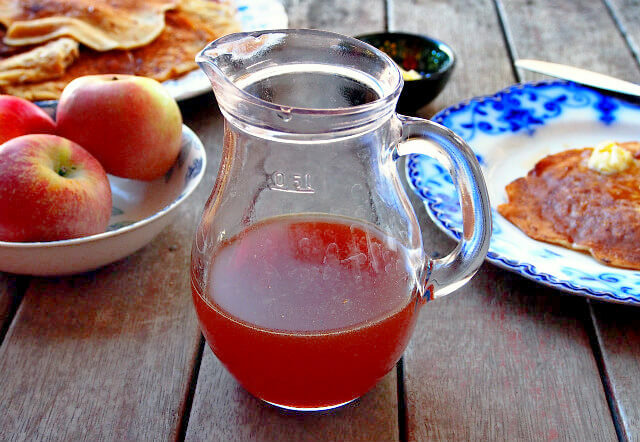 The resulting syrup is thick, fragrant, and luxuriously sweet and delicious. It scents the whole house while it’s cooking, so it’s a lovely way to wake everyone up on a Saturday morning. The process is simple, but it does take time, especially if you use a small pot. I like using a big soup pot with a broad bottom or a large frying pan since the bigger surface area makes the evaporation process go faster. Once the juice has reduced, remove from heat and set aside to cool. It will thicken as it cools. 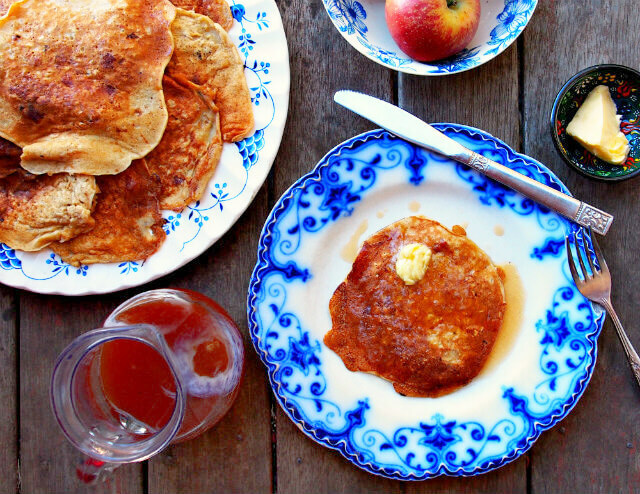 Once the brunch party pancakes are made, serve them hot with plenty of salted butter and a jug of apple syrup. They also go well topped with vanilla yogurt or whipped cream. 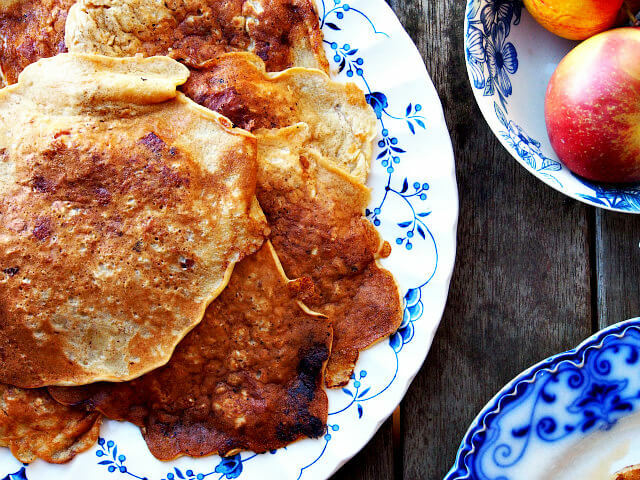 With their almond and bacon flavors, I would pair the pancakes with our Pick Me Up Oolong, a luscious maple and almond tea, or our Caramel Almond Black Tea with apple pieces and cinnamon chips. If you prefer a caffeine free option, the Hello Sunshine herbal blend with turmeric and maple is an excellent choice. In large bowl, stir together rolled oats and yogurt. Set aside for 20-30 minutes to soften oats. Chop bacon into small pieces and fry until crispy. Remove from pan with slotted spoon and drain on paper towel. Stir into oats and continue soaking process. In small bowl, beat eggs with almond extract, honey, and oil, then add to oats and stir well until mixed. In another small bowl, mix together sea salt, flour, nutmeg, and baking soda. Stir into oat mixture. Using a 1/4-cup measuring cup, scoop batter onto hot, lightly greased griddle. When holes appear on top of pancake, about 2-3 minutes, flip carefully and cook another 2-3 minutes. Serve warm with salted butter and apple syrup (recipe below). Place apple juice in medium saucepan over medium-high heat. Bring to boil and simmer until liquid reduces to 1 cup. Pour hot into sterilized bottle and seal, then set aside to cool. When cooled, keep in pantry until ready to use. If using soon, keep in fridge until ready to serve.